Sometimes you just can’t decide what flavor of cake to make! A few months ago, I saw this viral video made by So Yummy and was obsessed! I loved the concept, and decided to test it out with some of my favorite flavors. 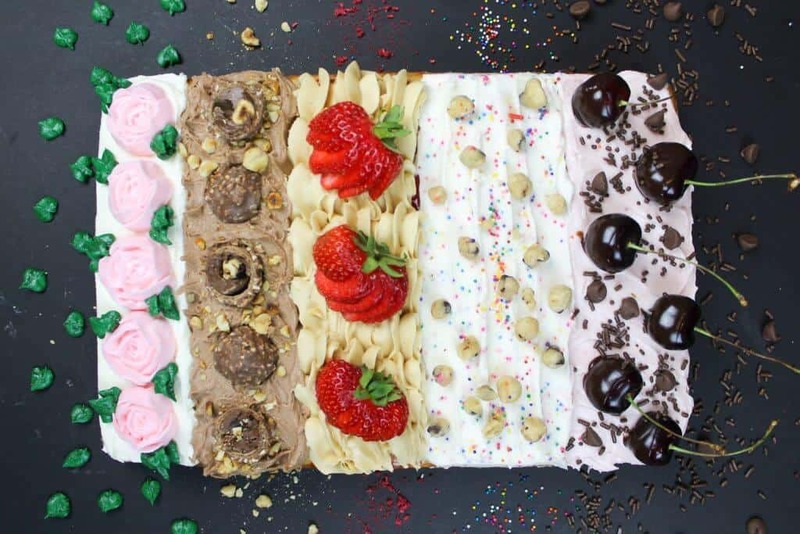 I had the hardest time narrowing down my flavors, but ended making the sections chocolate covered cherry, funfetti cookie dough, PB&J, Nutella, and rose water! The Nutella section ended up being my favorite. To create these flavors/fillings, I used the below items from my pantry! Most of these ingredients I already had, but you can alter your flavors for whatever you have on hand (my pantry is literally all baking supplies and sweets). The beauty of this idea is that you can customize it to whatever flavors you want! I used a half batch of my vanilla layer cake recipe to make a 9×13 inch sheet cake, and 1 batch of my American buttercream to make this cake. All of the different frostings on this cake are made using my american buttercream as a base. First, measure the sheet cake with a ruler, and lightly score it with a knife, to divide it into 5 equal section. Next, make the funfetti cookie dough section! Use a 1.5 inch circle cutter to remove 4 circles of cake. Fill with edible cookie dough balls. Place 3/4 of a cup of buttercream into a bowl, and mix with 1/2 cup of non-pariel sprinkles. Spoon onto the top section, and smooth using a small offset spatula to create horizontal lines. Top with small bits of edible cookie dough and more rainbow sprinkles. To make the PB&J section of this layer cake, use a biodegradable straw (or a chopstick) to poke holes throughout the third section of the cake. Heat about 1/3 of cup of strawberry jam in the microwave for about 15 seconds, then spread across this section of the cake. Allow the jam to run into the holes, to have the same effect as a poke cake! Place 3/4 of a cup of buttercream into a bowl, and mix with 1/2 cup of peanut butter (or to taste). Place into a piping bag fitted with a Wilton 1M tip, and pipe ruffles horizontally across this section. Top with 3 fanned strawberries. For the Nutella-inspired 4th section, use a 1 inch cutter of your choice (I used a heart shaped cutter, since I LOVE Nutella :P) to cut 4 equally spaced holes across this section. Fill with Nutella. Place 3/4 of a cup of buttercream into a bowl, and mix with 1/3 cup of Nutella (or to taste). Spoon onto the top section, and smooth using a small offset spatula. Tap the tip of the offset spatula around the frosting, to create a textured pattern . Top with halved Ferrero Rocher, and a sprinkle of toasted hazelnuts. In the final section, cut out four holes using a 1 inch cutter. Mix about 3/4 of a cup of buttercream with a teaspoon of rose water, and drop of pink gel food coloring. Place pink rosewater buttercream into a piing bag fitted with a wilton 104 tip (or whatever petal tip you have on hand). Fill each cut out with this buttercream. Top with plain vanilla buttercream, and smooth flat. Pipe 5 buttercream roses using a flower nail, and place across the bottom section using a pair of small scissors. If desired, color 1/3 of a cup of frosting green and pipe some leaves around the roses using a Wilton 352 tip. Slice each section into equal sized pieces, and see which flavor your party likes best! I brought this cake into my office, and despite me loving the Nutella section, the fan favorite was the PB&J section. This recipe is a half batch of my vanilla layer cake recipe! It's perfect for making smaller cakes, and I usually use it to make 3, 6-inch cake layers. Preheat oven to 350°F. Line three 6 inch pans (for taller layers) or 8 inch round pans with parchment rounds, and grease with non-stick cooking spray. If baking a sheet cake using this recipe (one batch makes two 9x13 layers of sheet cake), be sure to place one of two flower nails upside down toward the center of the plan, to help the layer bake more quickly and evenly. Layer cakes take 38-40 minutes to bake, but can vary based on the size of sheet pan you're using. If you are making frosting for a cake, it is important to mix the buttercream on low at the end of the process for a couple minutes, to get out any extra air that might have be incorporated during the mixing process. This will make it easier to get super smooth sides on your cake! a half batch of my frosting (which this is!) should frost about 3 dozen cupcakes!